INDIANAPOLIS -- He came. He saw. He jumped. That was the game plan for Connecticut cornerback Byron Jones, and he executed it perfectly by posting some eye-popping numbers Monday at the NFL Scouting Combine, including a broad jump that obliterated the previous best combine mark and is thought to have broken a 46-year-old world record. Jones had a 12-foot, 3-inch broad jump in an amazing display of athleticism. Not only did he turn heads with a crazy broad jump, but he fell just short of Georgia's Chris Conley (45 inches) for the top mark this year in the vertical jump with 44.5 inches. That he was even able to jump, much less put up those numbers, is an impressive accomplishment for Jones, who is still recovering from surgery to repair a torn labrum. He won't run the 40-yard dash while recovering, NFL Media Insider Ian Rapoport reported Monday. "You are now a verified freak, Mr. Jones," NFL Media analyst Mike Mayock said, after hearing of Jones' numbers in the vertical and broad jump during NFL Network's coverage of the combine. While there is a lot of internet evidence Jones' combine broad jump effort is a world record for a standing long jump, nothing has been made official yet. Norwegian Arne Tvervaag is believed to have held the world record of 12-2 set on Nov. 11, 1968. The standing long jump hasn't been an Olympic event since 1912, so records are spotty. American Ray Ewry, who won gold medals in the event in the 1900, 1904 and 1908 Olympic Games, had held the world record (11-4 1/2, 1904) before Tvervaag established a new mark in '68. Buffalo Bills receiver Marquise Goodwin qualified for the long jump in the 2012 Olympic Games and was a two-time NCAA champion in the event while at Texas. 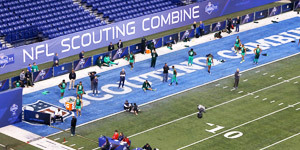 At the 2013 combine, Goodwin posted a broad jump of 11 feet. NFL Media analyst Daniel Jeremiah ranked Jones as his No. 50 prospect in his recently updated top 50 draft prospects list. Considering how impressive he was in limited action, Jones is probably a prospect that teams will re-evaluate as they head into the thick of preparation for the 2015 NFL Draft.